Today is Memorial Day. 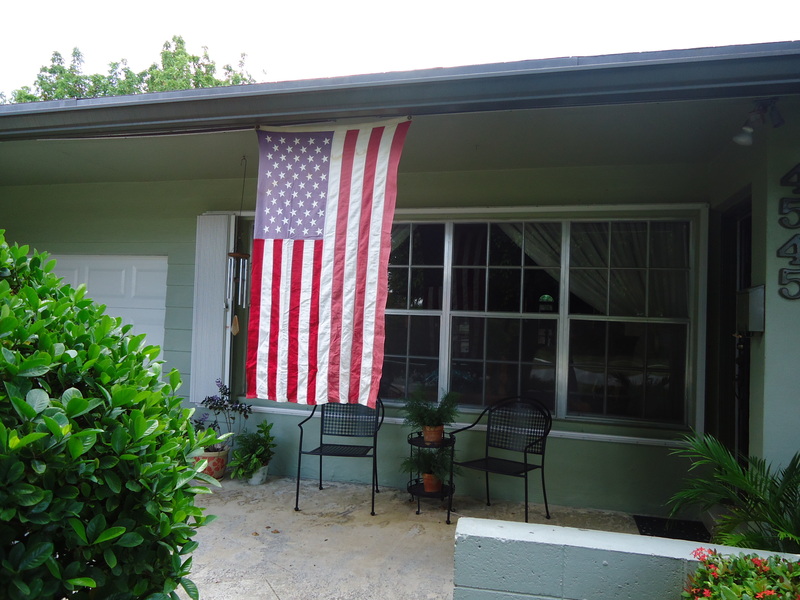 My dad was a WWII veteran and very patriotic so I hung his flag up for him. It is old and faded and rests, folded, on top of the urn that houses his remains. Today it flew in memory of the man he was: conventional, loyal, generous, and principled. Here’s to you dad. Happy Memorial Day. Before my father passed away, I tried to explain to my friend, Kimberly, what it was like losing my father to dementia. Pretend you are standing at the end of a very long lit hallway. Slowly, starting at the opposite end, the lights start to go off. Sections of the hall become enclosed in darkness and the light is shrinking as the darkness gets closer to where you’re standing. That’s an image of watching a mind vanishing one small piece at a time. On my cell phone I have ten or eleven saved voice mails my father left for me when he was well. They are the voice of a different man than the one who passed away in January. That man would call me up out of the blue just to tell me he loved me. That man knew I was his daughter and that I was in school studying to become a nurse. 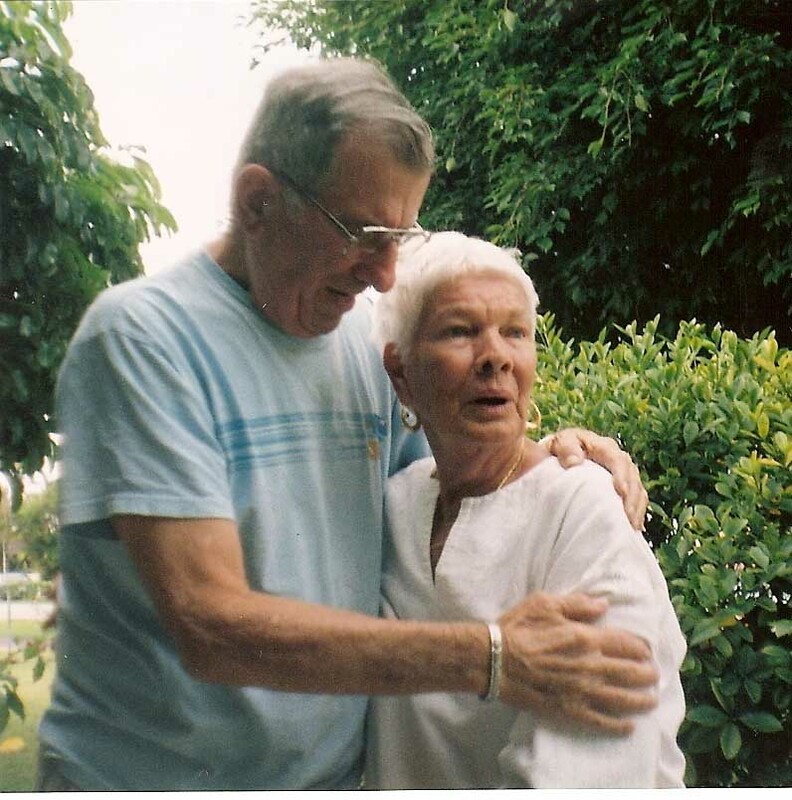 That man knew the beautiful woman in his home was his wife and that she was the all time love of his life. That man was proud of his children and grandchildren and loved them with all his heart and knew them by their names and their faces. That man had no idea he would begin fading away long before he left us. If he knew, it would have broken his heart. I’ve only listened to those voice mails once since my dad passed away. It’s still too soon. I’m still letting go. I’m still saying goodbye in my own personal way. Tears sometimes come to my eyes when I hear a striking piece of music or read something exceptionally beautiful. I will feel a profound sadness and know I am feeling the loss of my dad. This letting go takes time. Saying goodbye to someone we love might be very sacred and it might be what must be done but it is also very hard. In January of 2007 my dad surprised my mom with a Volkswagen Beetle for their 50th wedding anniversary. The photo on this post was taken the moment she realized the car was hers. She had dreamed of having a Beetle one day and my dad loved her so much he wanted her to have a car that would make her happy. I love how deeply he loved my mother, you can see it in the way he is holding her. My father loved his life which is why I think it took him a while to let go. Back in December of 2009 he was starting to struggle with moving around and beginning to experience symptoms of dementia and we had to help him climb into bed each night. He couldn’t make his body move the same way it used to. At bedtime he was so tired his legs would freeze in place walking the few yards between the bathroom and his bed. They literally would not move. We’d say “Come on dad, let’s go.” He’d say “Well, OK” in an enthusiastic voice and my dad, my mother or one of my sisters and I would crack up laughing. A couple of times we laughed so hard I almost peed my pants. My dad was happy. He went with the flow easily and willingly. How could he maintain his positive attitude when his body and mind were working against him? He didn’t let things get to him. I find this remarkable. I whine if I get a headache once in a while or I’m feeling tired. My dad never complained or felt sorry for himself. He kept one foot in front of the other and didn’t give up. I have a new job as a nurse and yesterday I met an older client who is almost blind and said he’s grateful for every day he gets to put his feet on the ground. Can you imagine? This week I met a woman whose son is a paraplegic with pressure ulcers so bad they are down to the bone. She wasn’t complaining, just telling me her story. When I think I’ve got a problem, it helps me to remember stories of real people dealing with challenging health issues yet still feeling grateful. My dad, the blind gentleman yesterday, the woman and her paralyzed son. That is what I call courage. There are several things about dying that increase the risks of constipation, an issue that is taken VERY seriously by hospice. A couple of those things are: a lack of mobility makes for sluggish intestines, taking narcotics for pain, and eating low fiber foods. My father did or had all three. Here’s what happened one day last fall when my mom was playing bingo at the Greek Church like she does most Thursdays. I’m beginning to worry because my dad hasn’t had a good B.M. in a few days. The rule of hospice is to keep the bowels working so there is no impaction which can end up being dangerous, sometimes needing surgical intervention. Since my father is a hospice patient and has a DNR order, the hospital is not an option and we want to avoid impaction at all costs. It can also cause extreme pain for the patient. Dad is weak and can’t stand up alone and it is very challenging to get him out of bed without someone helping me. For some insane reason I ask him if he needs to poop. He says yes. I know the best way for this to happen is to get him into the bathroom and on the toilet to have gravity do the work of bringing it all down. Miraculously, I get him up from his hospital bed in the family room and arrange him behind his walker. Pushing his walker, he shuffles toward the bedroom with me hanging onto his shirt so he won’t land face down on the floor. He’s so unsteady it’s shocking he doesn’t fall in the hallway and I hold my breath with every step he takes. Somewhere after we’ve turned the corner in the bedroom to head past the dresser, his legs begin to give out and he slides to the floor. Though he weighs less than I do, he and his body do not do what I ask and I could swear he weighs 300 pounds. When I pull, he pushes. When I push, he pulls. 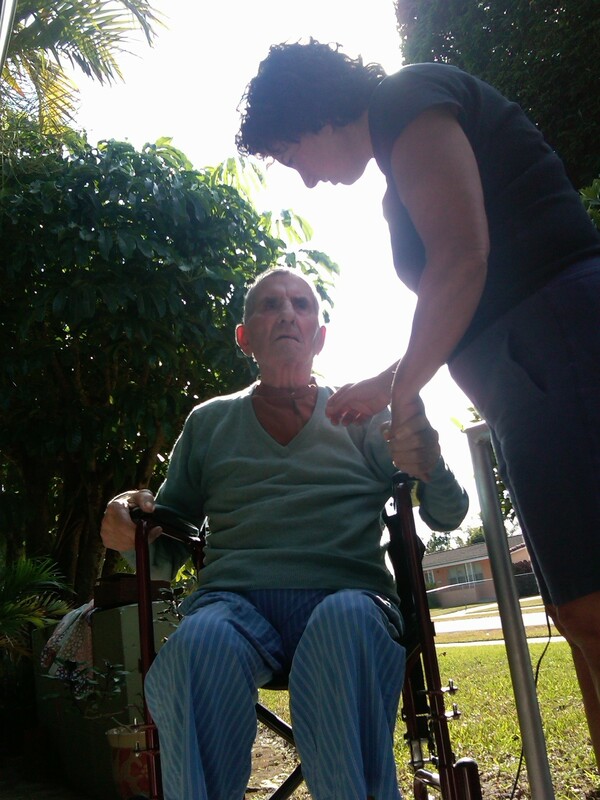 He fights me as the dementia kicks in and I feel like I’m with someone who is no longer my father, this is a stranger who will not do what I want him to do. He’s pooped in his diaper so I have to change him while he is lying on the floor. I do this by rolling him side to side, trying not to get poop on the rug. I am getting very upset and very angry and he laughs at me. I see he is bleeding from a skin tear on his tissue thin skin. There is blood on the yellow carpet. Great. I put a pillow under his head and try to figure out what to do. I attempt to lift him and he ends up sliding across the carpet. I go to the living room to look outside to see if either of our two male neighbors are home. Both their vehicles are gone. Crap. I can’t call 911 because he is DNR and I don’t dare take a chance of anyone wanting or trying to do any kind of heroic thing with him. I don’t want to call my mom because she needs bingo to get a break from all of this. I try calling her several times but she doesn’t answer. I also do not want to admit I can’t handle this. I am a new nurse and I want to prove I have what it takes. Stupid thinking but there it is. Now I am very upset. I am sobbing and somehow I’ve transported myself back to childhood and it’s all my dad’s fault, lying there smiling at me with sarcasm in his eyes. This is not a situation I am proud of but stress and helplessness have taken over my rational mind. I leave the room and go cry in the family room. I go back into the bedroom and try to lift him onto the bed. No luck. I do this several times. I am exhausted and I know my father must be as well. Every time I try to lift him and can’t, I go and cry and gather myself and decide to try again. It’s been about an hour and a half and I can’t believe I am unable to lift this feeble man. Finally I am able to heave him up on the edge of the bed and drag him onto it, his body resting across mine. This gives me hope. I maneuver him to a sitting position, pull him into his wheelchair and bring him back to his bed. I am spent. He is exhausted. I can see it in his face. Getting him back into his bed is a breeze compared to what just happened. I settle him into bed and apologize for losing my temper. I think he may have smiled. I probably leaned over him and said “time for a hug dad,” and “I love you.” Like I always do. On our refrigerator is the same photo of my dad and me that accompanies this blog post. It was taken on Christmas day and was the last time he went outside. Marla, my dad’s Certified Nurses Assistant and now our dear friend, took the photo and we have it displayed in a prominent place so we can look at it whenever we want to. This morning I was trying to find the inspiration to write and couldn’t find it until I looked at the photo. What always strikes me when I look at it is the look of complete vulnerability on my dad’s face. If you knew him you could also see, maybe it comes across even if you don’t, that he is not happy. He has a grimace on his face and because I knew him so well, I believe he felt confused and possibly annoyed that we got him up and dressed and out to the front porch. It was a bit cool and we dressed him in one of his very old cashmere golfing sweaters with a t-shirt underneath. We wanted to make sure he didn’t get cold because of his lack of body fat to insulate him. He is looking at me intently and I don’t remember what I was saying to him. We are making eye contact and because of his delicate state, I believe there is trust in the way he is looking at me and the way he is holding tightly to my hand. By this time, three weeks before his death, he barely had any vocabulary left in him. He was increasingly non-verbal as the dementia claimed more of his brain. Though I doubt it is a conscious decision, a person in my father’s condition is forced to turn over their independence to their caretakers. It happens in stages as they lose control over every aspect of their lives. I become my father’s voice. I was his advocate. Because I was his nurse, my family supported me in taking on this role. My mother and sisters were incredibly supportive in the decisions we made to discontinue all non-palliative medications and to not force him to eat when it became clear he no longer wanted to. We were a team joined in the common goals of making my father as comfortable as possible and having his passing be peaceful and surrounded by his loved ones. I was my father’s voice. As the weeks passed he became more and more like an infant. He could not talk or walk or take care of himself. Though there were many difficult moments with my father’s combativeness and my reactions to those moments, it was imperative that I respect how I knew my father wanted his last months to look like. I had to put aside all control of how I thought things should be and instead do what I knew in my heart he would want done. My awareness of how my father wanted the end of his life to look like was something intuited from conversations I’d had with him through the years. I had a deep understanding of how he felt about prolonging a life that was trying to leave. We knew but failed to remember he had a living will so we didn’t think to look for it. We found it after he passed away when my sister Jody was going through a small strong box of his papers. His living will spelled out exactly what we had intuitively done for him. He wanted no heroics of any kind. He asked that food and water not be forced when it was clear that death was imminent. He asked that all medications, except those for comfort, be discontinued. He asked that he be allowed to die with dignity and the living will, in it’s beautiful, poetic form, gave us permission to let him go, asked us to let him go. He wanted this and we followed his wishes exactly, never having read the living will. To love and respect someone is to honor their wishes in spite of what we think is right for them. There cannot possibly be anything more beautiful than carrying out the dying wishes of someone you love. The ultimate act of kindness and love is to step aside and allow this voiceless soul their final choice. This is the greatest gift you can give and you will never do anything more honorable. Nothing. Period. Dying is as sacred as birth but it’s heartbreaking instead of joyful, as most births tend to be. Nothing compares to the loss of someone we love, it leaves a hole in our hearts that never completely repairs itself. We go on, we live our lives, we fall in love, but we are never quite the same again. In some ways my father’s illness was a blessing. His decline took him away in fragments, leaving us ample time to say goodbye, each in our own way. 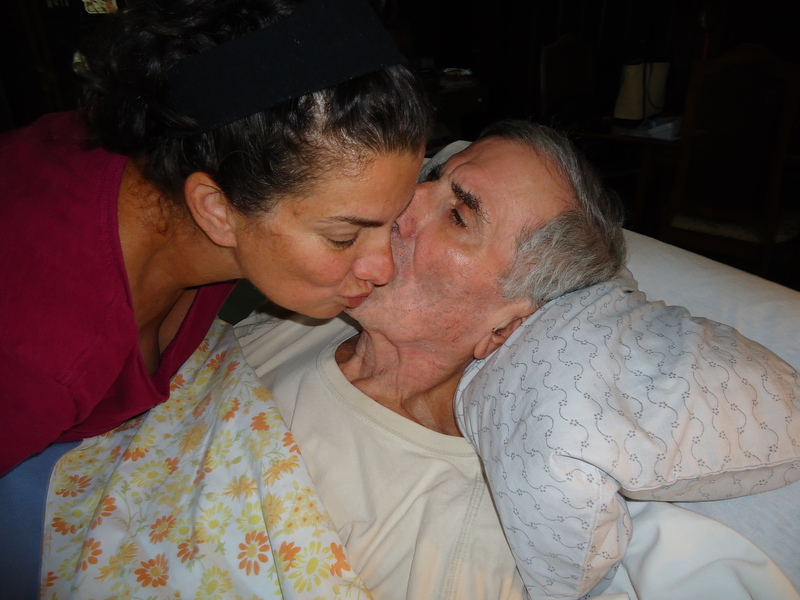 For me, as his main caretaker, I sacrificed him knowing I was his daughter for feeling complete when he was gone. I had the luxury of time to make peace with any unresolved issues I had left in me. The more vulnerable he became, the more tender I was, for the most part. In the spur of the moment, my father’s dementia could make him combative and angry and often I was the brunt of it. I was not always proud of how I reacted when he tried to fight me in those demented moments. Sometimes, forgetting his behavior was an illness, I would react in anger toward him then later, once in bed, would sob at how I had treated him. My heart would break and I would pray for forgiveness and to become more patient and loving. It gave me a clear picture of why war doesn’t work. Anger responding to anger cannot create peace. It only escalates into pain for both sides. One of the participants must back down and turn in the other direction and resolve to behave differently. That’s what I began practicing. There were hard and painful lessons but love was the prevailing force between my father and me during those months. Today, almost four months since he passed away, I know the choice I made to come home and care for him was the best choice I ever made. I know what I shared with him was beautiful and difficult and extremely profound and nothing in my life will ever quite match it.